Q: What are termites and how do they harm my home? Termites are miniscule insects that in New Jersey live underground (subterranean). A colony can consist of 60,000 to over 1.5 million, made up of groups that have specific functions, workers, soldiers, winged swarmers and of course the queen and king. They love warm, moist conditions. 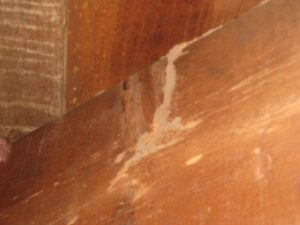 For residents, a NJ Termite Inspection is likely required and at the very least strongly suggested. Unlike other wood destroying insects like carpenter bees and carpenter ants that damage wood by tunneling holes to lay their larvae, termites actually eat wood or more precisely the cellulose primarily found in wood. In consideration that your home is wood framed, this becomes like a 5 star restaurant for your average termite. 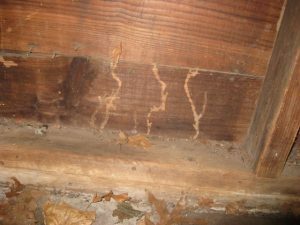 Termites can eat away all the framing of your house. Q: How do termites get into my home? As stated previously, subterranean termites live in the ground. They are continually foraging for wood (food) and as their colony numbers grow, they search further away. If part of your home is in direct contact with the soil, termites go straight into the wood. They do not like direct sunlight, so to protect themselves, they build mud (shelter) tubes on walls open to daylight, until they come to a food source, at which time they go into the wood. Q: If I have termites what do I do? All the inspectors of Total Home Inspection Services are fully licensed to perform wood destroying insect inspections (including a NJ Termite Inspection). This is normally a requirement of your lending institution when purchasing a house. Upon finding evidence of termites we put you in contact with a pest control company that will come out and treat your home. Any damage to framing should be repaired or replaced. Stack all firewood and lumber several feet away from your home. Keep all wood supports for porches, decks or other building, more than one foot away from soil contact. Remove any mulch that is less than one foot away from framing. Use only pressure treated timber for all construction that contacts the ground. (Note: this gives only limited protection). Repair any exterior leaks. Consider a contract with a pest control company to install termite monitoring bait stations.